I spent the later part of the afternoon yesterday meeting with a friend and congregant to compare notes and discuss Mussar. Mussar is a movement coming out of Lithuania in the 19th century. Mussar is about working on the improvement of character (the middot, or measures of goodness in a person). 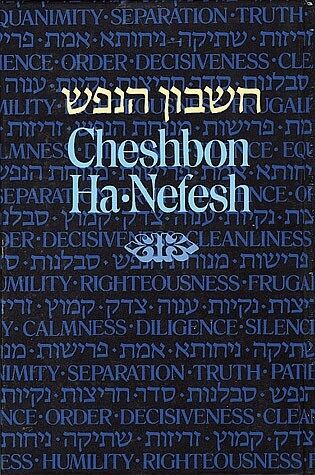 My friend and I are reading a few books like Alan Morinis’s Everyday Holiness and the 1845 classic Cheshbon Ha-Nefesh by R. Menachem Mendel Levin and Mesillat Yesharim by R. Chaim Luzzatto. My original impetus for all of this is the Messianic Jewish program called Riverton Mussar, which I think, could be the basis of some great community and useful growth and change in our circles. Instead of focusing on ideas or methods, which too often divide us, Riverton Mussar focuses on being the kind of people we ought to be for each other, for God, and for ourselves. See Riverton Mussar here. And keep reading for a few more thoughts by a non-expert beginning the subject. First, if you start reading Mussar books and you have not read widely in Jewish as well as Christian literature, you may be put off by some of its quirkiness. Writers will sometimes state specific ideas about a subject with a certainty that seems overstated. You will find some strange and extreme ideas at times (like “a man should not have a conversation with a woman” and similar). Lest you think this is some particular crime of the Mussar literature, know that in many movements of practical holiness or spirituality these quirky and overly authoritative statements are made. It is a danger in any movement that seeks to be practical and which passes down traditions and practices from teacher to student. For example, I remember a period in which I read a great deal of Christian mystical and devotional literature. A particular favorite of mine at the time was Thomas a Kempis’ Imitation of Christ. For those familiar, it is the rare Catholic devotional book that gets the blessing of many Protestant leaders and is on many recommended reading lists outside of Catholicism. And I remember that I found both gems and lead in that book. In one place Thomas said you should not get too close in friendship with any person, as this will detract from your devotion to Christ. Needless to say, I did not agree at all. So, in reading traditional, practical, devotional literature such as the works of Mussar, you have be prepared to disagree with some advice and accept other advice. Second, if you have not read any Mussar and you are looking for something that is Jewish, that need not be controversial, that will not result in any internet arguments, but that will instead help you become a better husband / wife / son / daughter / friend / person, then Mussar is it. It is one of the streams of Jewish traditional writing and teaching that diverse people can easily get behind. Wikipedia explains the basics of the movement. Riverton Mussar explains the basics of the movement. Read Cheshbon HaNefesh online for free. This entry was posted in ethics, Judaism, messianic, Messianic Jewish, Messianic Judaism, Spirituality. Bookmark the permalink. I’ve read Morinis’s Everyday Holiness more than once, and while I find the Riverton Mussar site compelling, a necessary pre-requisite for studying mussar (beyond a casual reading of various materials) is a “chevruta” or partner. I’m not sure mussar works in isolation, but then again, I’m hardly an expert.